Dim sum is a colloquial Chinese phrase that means "small portions of a variety of foods." These little snacks are flavorful bites that span the gamut of Chinese flavors and ingredients. They are usually served at restaurants from little carts, but you can make these delicious recipes at home. 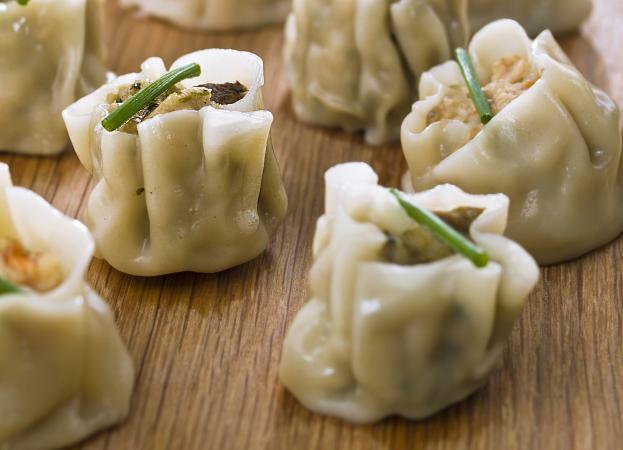 This may be the prettiest dim sum recipe on the planet. Ground chicken is paired with garlic, bamboo shoots, and hoisin sauce, then put into wonton wrappers. The wrapper is gathered around the mixture, with the top open, so the sides ruffle. The little dumplings are then steamed. Serve them with soy sauce for dipping. Sticky BBQ pork ribs and fried spring rolls are good with this recipe. In a medium bowl combine the chicken, bamboo shoots, green onions, garlic, hoisin sauce, soy sauce, egg, cornstarch, ginger, and five spice powder and mix gently but thoroughly. Prepare a steamer. If you don't have one, you can place a metal colander or strainer over a pot of simmering water, making sure the colander or strainer does not touch the water. Put about 1-1/2 to 2 tablespoons of the chicken filling into the center of a wonton wrapper. Brush the edges of the wrapper with a little water. Bring the sides of the wrapper up around the filling, pleating the wrapper and leaving the center open. Tap the shu mai on the counter to flatten the bottom. Repeat with remaining filling and wonton wrappers. Put about 8 to 10 of the shu mai into the steamer and cover. Steam for 6 to 11 minutes or until the chicken filling is cooked to 165°F. 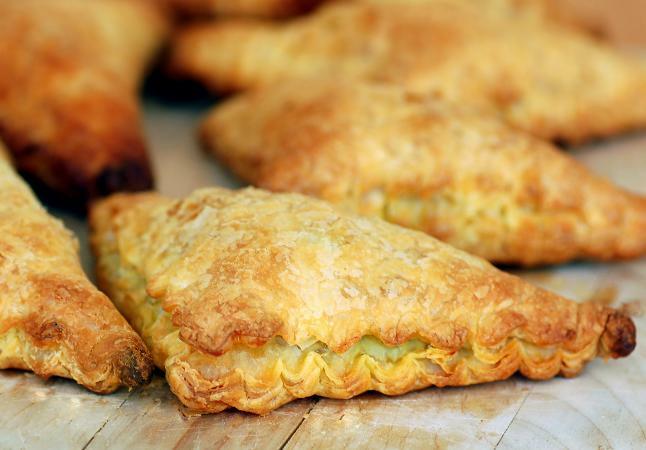 Curry puffs are turnovers are made with curry powder, mushrooms, shrimp, and garlic. They are simple to make as long as you cool the filling a bit before you make them and keep the puff pastry cold so the dough puffs well in the oven. This recipe is slightly spicy and very flavorful. Serve it with some fried beef meatballs and steamed pork dumplings. In a medium skillet, heat the oil over medium heat. Add the garlic and stir for 30 seconds. Then add the shrimp. Cook and stir until the shrimp curl and turn pink. Remove the shrimp from the skillet with a slotted spoon and set aside. Add the mushrooms to the skillet. Cook, stirring frequently, until the mushrooms give up their liquid and the liquid evaporates. Meanwhile, chop the shrimp into small pieces. Add the curry powder, turmeric, vegetable broth, cornstarch, salt, and pepper to the mushrooms in the skillet and bring to a simmer. Simmer for 3 minutes, stirring frequently with a wire whisk, until the mixture thickens. Add the shrimp to the mushroom mixture and stir. Pour this mixture into a medium bowl and set aside. Let the mushroom mixture cool for an hour. Unroll the puff pastry sheets and cut each into 9 equal squares. Put 3 tablespoons of the shrimp filling into the center of each square. Fold the squares over, forming a triangle, and press the edges to seal. Use a fork to crimp the edges closed. Place the puffs on a parchment paper lined cookie sheet. Gently brush each puff with some of the beaten egg. Bake the puffs for 15 to 20 minutes or until the pastry has puffed and is golden brown. These little meatballs are not like any other you have ever tried. 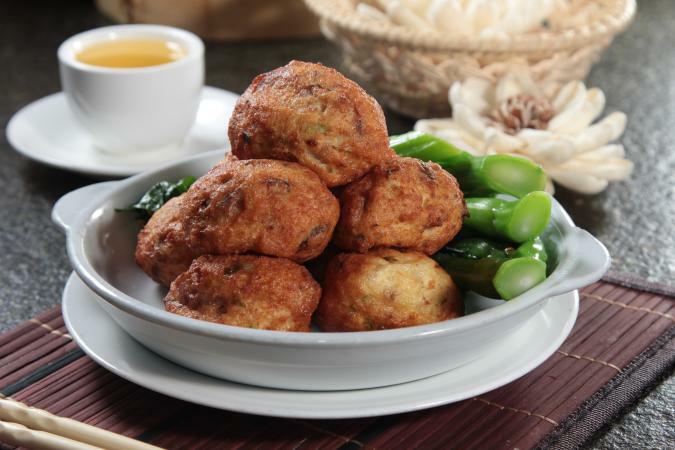 The spicy meat mixture is rolled in cornstarch and fried until golden brown and crisp. Serve them with a purchased sweet and sour sauce. They are delicious served alongside steamed pot stickers and steamed buns. In a small skillet heat the safflower oil over medium heat. Add the onion and garlic and cook, stirring for 3 to 4 minutes or until tender. Put the onion and garlic mixture into a large bowl. Add the water chestnuts, ginger root, pork, soy sauce, and cayenne pepper to the onion mixture and mix gently but thoroughly. Form the pork mixture into 1" meatballs and place on a cookie sheet. Cover the meatballs and refrigerate for 1 hour. When you're ready to cook the meatballs, put the peanut oil into a large heavy saucepan and attach a thermometer to the side of the pan. Heat the oil to 350°F over medium high heat. If you don't have a thermometer, heat the oil until a bit of cornstarch dropped into the oil sizzles. Toss the meatballs in the cornstarch to coat. Fry the meatballs, about 8 at a time, until they are golden brown and cooked through to 165°F. Drain the cooked meatballs on paper towels and serve. These recipes, served together, make an excellent party menu. However, you can make each one individually as an appetizer or a snack. Enjoy your homemade creations.